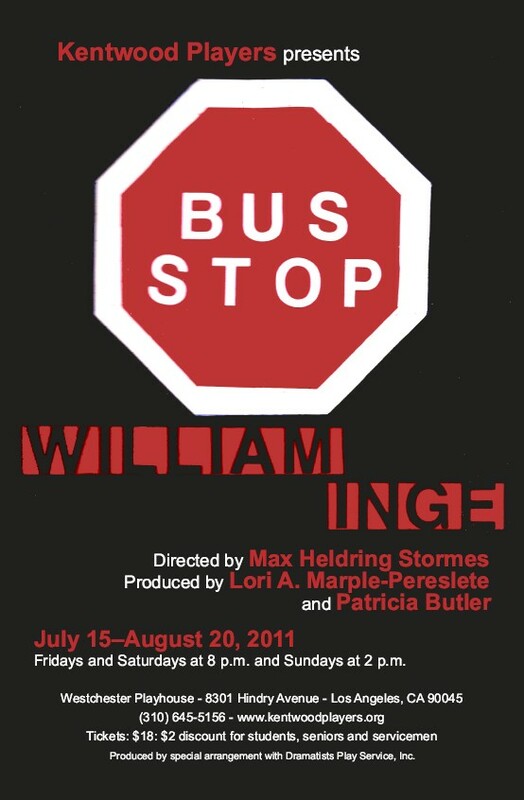 Bus Stop by William Inge is a drama with romantic and comedic elements, set in a diner about 30 miles west of Kansas City in early March 1955. A freak snowstorm has halted the progress of the bus, and the eight characters (five from the bus) have a weather-enforced layover in the diner from approximately 1 to 5 a.m. Romantic or quasi-romantic relationships ensue as they wait out the storm, most notably between cowboy Bo and hillbilly chanteuse Cherie. The original Broadway production was nominated for four Tony Awards in 1956 including Best Play. (standing, left to right) John Russell, Andy Grosso, Neil Engelman, Valerie Ruel, Janet Lee Rodriguez, David Kunzle. Bo thinks the way to get Cherie is to handle her like his cattle. “I don't wanna go to some Godforsaken ranch in Montana!! !” is her response. Bo tries to persuade Cherie that he is the right guy for her. Elma and Grace share a quiet moment in the diner before the bus arrives. Grace and Carl get to know each other better over a cup of coffee. Professor Gerald Lyman is not quite sure what Grace has served him, even though she insists it is fresh coffee. Elma has never met anyone like the Professor, and he fully enjoys her attention. Virgil serenades Cherie, but is aware that Bo's jealousy is getting the best of him. After trying to land a punch, Bo is shown the door by the local Sheriff. The reason for Professor Lyman's confusion becomes more apparent as the night wears on.